Before the Incarnation the immaculate virgin and the just man are wedded to each other in true married love. The mystery of the Savior’s coming into the world begins with a betrothed couple whose relationship is based upon a desire to give themselves entirely to God’s love. In ways they could not know, this betrothal was part of the very plan of God. Imagine Mary’s gratitude and her trust that her love for Joseph would express and support her most pure love for God. 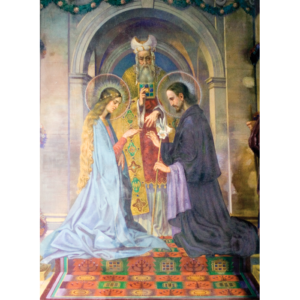 Think how Joseph must have considered himself most blessed to be betrothed to most holy Mary. Admire their unconditional commitment to each other according to God’s plan. Meditate with the Holy Spouses on the wonder of God’s call for you. Mary, full of grace, and Joseph, son of David; honor to you, Mother of God, and to you, guardian of the Redeemer. Eternal praise to the child with whom you formed a family, Jesus the Promised One.